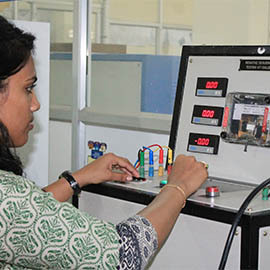 Control Systems Lab focuses on technical implementation issues of classical control theory in the frequency domain and modern control theory in the state-space. 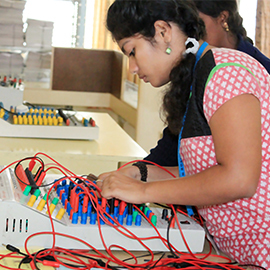 This laboratory is having different setups for the study of various topics of control systems, like Control of Servomotors, synchros and PID controllers. In addition to conventional experiments students will use Matlab software. 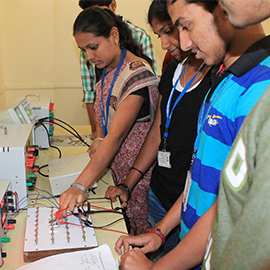 This lab is useful for the students for the design projects related to various controllers like P,PI and PID. Students can design RC Lead compensating network. Students can find the transfer function from Graph. Students can design RC Lag compensating network. Students the effect of input waveform on steady state error , effect of lead compensation and PI controller Using MATLAB. Students can verify the specification both theoretically and practically. Students will get to know how design type0 type1 type2 system and variation with respect step, ramp, parabolic inputs. Students how the for same value of gain will effect the stability in bode plot, root locus, Nyquist.